Emergency Electronics Review: SPOT 2, DeLorme InReach, SPOT Connect, ACR ResQLink, and "Find My Friends"
Over the past few years, I don't know how many times I've heard someone say what a good idea it would be to "get a SPOT". Launched in 2007, the ad campaign for the original SPOT introduced many outdoor sports enthusiasts to the concept of emergency satellite messaging devices. But, more than five years later, there still remains a lack of understanding of how these devices work. When I began researching them for my own use, I was struck by the variety of options available and especially by how truly different each of them are, even though they are widely viewed as all fitting into the same category of device; upon closer inspection, they clearly do not. This satellite constellation is the largest and most complete, and is essentially military. It has provided the satellite support used for Emergency Position Indicating Radio Beacons (EPIRBs), which are designed exclusively for marine use, for more than 30 years. Over 33,000 people have been rescued as a result of this network, worldwide, since the program's inception. COSPAS/SARSAT now also supports PLBs, which are essentially EPIRBs for land-lubbers. It is very important to understand that a PLB is not a SPOT! This network covers the entire planet. A series of problems with satellites from its first constellation launch was supposedly addressed in 2011 and 2012 with the launch of several additional satellites, but the total efficacy of their current network is widely questioned, still. The Iridium network contains approximately 77 satellites which cover the entire planet including Polar Regions. Its track record over the past 5-6 years has been less blemished than that of Globalstar's, but whether it still outperforms Globalstar is a matter of debate (For the record, the Iridium-supported device we tested worked more often than the Globalstar-supported devices). A PLB does not require a paid annual subscription to send an SOS message. It transmits an SOS message with GPS coordinates via satellite, and in addition to that, emits a homing signal on the 121.5 MHz emergency frequency, at a power level 5 to 10 times higher than a SEND (SPOT or InReach) device. Furthermore, the PLB is much more likely to acquire the satellites necessary for a GPS coordinate lock than a SEND device. A PLB emitting a distress signal in these two manners absolutely represents your best chance of being located and at this most basic level, is a better device than anything operating on Globalstar or Iridium. That is to say, when it comes down to the nitty-gritty and you press that SOS button, a transmitting PLB is far more likely to get you rescued than a SEND device. Don't forget this. These devices require a paid annual (or monthly) subscription and transmit on a higher frequency (1610 MHz) to a commercial Rescue Coordination Center operated by Globalstar or Iridium. If you don't pay, you don't get rescued (It's interesting to note that even when you don't pay your mobile phone bill, you can still dial 911). If all I cared about was getting rescued when I pressed the SOS button, I would not have written this review because choosing a PLB instead of a SPOT would be a no-brainer, and I would be encouraging all of my friends to ditch their SPOTs and get a real PLB device. But it's more complex than that, and the additional features available with the SPOT and DeLorme devices reviewed here make them worth considering. SEND devices transmit your GPS coordinate location only, and not all of the time. The SPOT 2 transmits its signal at one-tenth of the strength of the ResQLink, and there have been many documented cases of the SPOT 2 not transmitting an SOS successfully, and / or transmitting an SOS message without a GPS lock, which tells authorities and your contacts that you're in trouble, but not where you are. SEND devices do not emit the additional homing signal on 121.5 MHz. Also, the 5 watt 406 MHz PLB signal emitted by a PLB can be used by rescuers to establish an approximate location, whereas the SEND device's less powerful signal cannot be used in that way. If your SEND device can't get your GPS coordinates out due to line of sight obstructions, you'll wish that you'd bought a PLB instead. In summary, in pure SOS terms, a PLB such as the ACR ResQLink is a far superior choice. The SEND devices offer some interesting and useful additional features, however, so read on to find out which device is best for you. 1Will it successfully transmit an SOS when you need it to, most? What if you are unconscious? For SOS functionality, the long track record and dual transmission power together with the COSPAS/SARSAT satellite network make the ACR ResQLink the clear winner, and virtually any PLB will perform better in this capacity than the SEND devices we tested here. 1. If I crash in dense trees or in a canyon and end up lying on my device it very likely will not work, based on my testing and many reported SPOT-fail incidents. They are serious when they say "Give clear view to sky" in the manual of each device. Even a small amount of backpack material or light forest coverage can prevent a successful GPS coordinate lock. 2. In this case, someone else has to immediately recognize that you're in trouble and then get the coordinates from your shared map page and organize the rescue. This will likely take time, but it may make body recoveries easier. 2Is it easy to use? Can anyone pick it up and use it if needed? Out of all of the devices, the ACR has the clearest and simplest instructions for initiating an SOS. The SPOT 2 comes in 2nd place here for simplicity, but the InReach has the most thorough instruction label on the device. The SPOT Connect scores a 0 (zero!) in this category. 3What are your priorities? Messaging, rescue only, tracking? If messaging is the most important feature for you, the In Reach is by far the winner and beats the SPOT Connect by a large margin. If you want the ability to send one simple pre-defined check-in message which isn't of crucial importance anyway (a significant percentage of the SPOT 2 messages I sent, failed), then the SPOT 2 is a contender. For tracking, all three of the above devices functioned reasonably well with the InReach slightly ahead. And finally, if you really just want the best SOS functionality, then the ResQLink is absolutely the device to choose. In summary, the InReach bills itself as a "2-way satellite communicator" and it lives up to its title. You can indeed communicate via satellites and it also, on the side, has as SOS feature. The SPOT devices are advertised as "satellite messengers" and in the case of the Connect, a "satellite communicator" (one-way only, that is). Fair enough, you can get some messages out to your contacts, sometimes. Only the ACR ResQLink's description truly inspires confidence that it is a real emergency device: "Personal Locator Beacon". And it's an accurate summary. A PLB's chief feature is getting you found in an emergency and it does that better than SEND devices, which is extremely important to remember. 4Lastly and least importantly, what is the initial and annual (minimum, and ideal) cost? The SPOT 2 is probably the best selling of the three devices we tested. After a few months of use, I believe this is mainly the result of SPOT having launched the most aggressive and widespread marketing campaign in the US, and not the result of it being the best product available. Originally, I was on the verge of purchasing a SPOT 2 based on the fact that this is what most of my friends have and use, but I was intrigued by the number of failed messages that people were reporting. I frequently heard friends say that their messages didn't send, which struck me as an odd quirk for a product which is meant to increase personal safety by sending messages. Thus, my research began, and it doesn't take long to find documented cases of the SPOT 2 failing in emergency situations, either. When you receive your SPOT 2, the instructions make it perfectly clear that you will need to buy a subscription for it to work. Paying for and setting this up is the first thing that you will do. The setup process was relatively painless. Create an account, pay, and activate. You have several service options, see the cost table for details. With that out of the way, I was ready to start using my SPOT 2. At the time, I was shipwrecked on Guana Cay in the Bahamas? ok not exactly shipwrecked or in any sort of SOS situation, so I decided to send a simple message to myself and my contacts through the "message" button. One minute later, nothing. 5 minutes later, nada. So I pressed it again. Another 10 minutes went by with no messages. The light blinked green, I supposedly had satellites in view, but it took another 45 minutes for one message to show up. Over the course of my testing, the SPOT seemed to successfully complete about 70% of the message-send attempts, at best. All in all, not impressive. Globalstar's satellite network is rumored to be improved since 2011, but the SPOT 2 consistently took longer to send messages than the InReach, which operates on the Iridium network. Whether this was a question of device functionality (the InReach transmits at 1.6 instead of 0.4 watts for the SPOT 2) or satellite coverage, we can't know. We used the Spot 2 side by side with the InReach throughout the test, recording the time needed for standalone messages to be received by contacts and confirmed as sent. The InReach messages were received faster than the Spot 2 messages about 60% of the time, with the InReach messages either confirmed as failed or received within 20 minutes almost every time. The Spot 2 messages at times confirmed as failed only 45 minutes after the send attempt, and were sometimes received more than 2 hours after the initial send. Testing these two devices side by side in standalone mode is the "apples to apples" test, but it's only fair to mention that the InReach, when paired with a smartphone, allows the user to watch the progress of the message send on the phone with a clear visual confirmation of it being sent successfully or not. This is a lot nicer than trying to decipher the blinking lights on the Spot 2, wondering if the message was sent or not. Since the chief feature of the Spot 2 is its ability to send messages to your contacts, and the InReach performs message sending so much better, the InReach is quite clearly a superior device for this purpose. Again, if SOS functionality is your main priority, we recommend the ResQLink. A popular anecdote illustrating a drawback of the Spot 2 (and any satellite messenger device which performs with less than 100% consistency) is that if your contacts are expecting to receive "ok" messages from you, then not receiving them is almost a guaranteed source of stress. If your family or significant other is expecting to receive "ok" messages at a certain frequency, and then they do not, it could cause them to raise the alarm unnecessarily. Indeed, there are many reported cases of this documented by rescue services, and many stories of a messaging device causing, instead of alleviating, stress for people who are tracking the progress of the user. If you are using the Spot 2 to reassure your contacts that you are ok on an hourly/daily basis, then be sure that everyone fully understands the limitations of the device and establish a clear understanding of what it could mean if the messages are not received. You might have already seen your friend's SPOT messages on facebook, checking in. My newsfeed frequently features notices from friends who landed their paraglider ok, or checked in while ski-touring or BASE jumping. The SPOT 2 only allows one pre-defined message though, which is usually some form of "I'm fine". The InReach, in contrast, allows you to send three different custom pre-defined messages, which is a big advantage if pre-defined messages are useful to you. The tracking function requires an additional subscription, and it allows you to create shared map pages on which your friends and family can track your progress. This is a fun and useful feature which could be just as valuable as the messaging ability to many users. In the hand, the SPOT 2 is small and light and much sleeker than the other devices we tested. The buttons themselves blink red or green depending on whether or not what you're doing is working, and there is a simple satellite coverage indicator light. The SOS button is protected by a small plastic clip-on cover, which requires an un-gloved 2-hand approach to release and access the button beneath. If you can't get your fingernail under the edge of the cover, you'll have to use a tool of some kind. In addition to the SOS function, the SPOT 2 also features a "Spot Assist" button which notifies your contacts that you are in a non-life-threatening situation but need help. You can also subscribe to the SPOT Assist program which will get your message sent to land or marine based assistance services. This would in theory be used in an "out of gas in the desert" situation instead of an "arm crushed under rock in desert" situation. At first this seemed a bit cheesy compared to the seriousness of a beacon's intended true purpose, but it could be a nice feature in a situation where your phone doesn't work and it's not life and death but you could really use a hand. That being said, the InReach's 2-way text message system blows the doors off of Spot Assist, in my opinion. One final note: I've been to the Arctic and to Sub-Saharan Africa four times in the past few years, and the SPOT 2 would not have worked in any of those places. If these regions are on your bucket list, then you can overlook the SPOTs. Compact and light-weight ergonomic design. SOS access and cover flap requires bare fingernails or a tool. Globalstar satellite constellation is arguably less effective than Iridium or COSPAS/SARSAT, and definitely covers less of the planet. Not as effective as a PLB in life-threatening situations. Like the SPOT 2, the InReach operates on a commercial satellite network and requires a subscription to function. Setting it up was not significantly different from the SPOT 2, but the DeLorme website is generally easier to navigate and the user account space is more intuitive. The DeLorme can be used as a standalone device a'la SPOT, or it can be paired with your smartphone, which is where it really shines. Contrary to the Spot Connect, the In Reach paired with my phone immediately the first time, and automatically every time after that. As Standalone: Even without the smartphone pairing, the InReach can still send 3 different custom pre-defined messages to your contacts. Instead of just sending an "OK" message, you could choose between messages which broadcast your need for a ride, the message that you're about to launch/depart/drop-in/whatever, or send a "meet me here" to your contacts. Basically, if you like the "Ok message" feature of the SPOT 2, then you'll love being able to send three different messages with the InReach. Choosing is simple, just hold the message button down until the light flashes 1, 2, or 3 times. Also, the DeLorme page allows you to view waypoints across a custom date range, whereas the SPOT system only allows you to choose up to the last 30 days. As a Paired Device: This is where the DeLorme really leaves the SPOT 2 in the dust. The features are many, but the two standouts are the ability to send and receive(!) custom messages via your phone to any contacts you choose, and being able to view your location on downloadable DeLorme maps. The free Earthmate app is simple and intuitive to use - each time I opened the app in a new location it prompted me to download the maps for that area, and it's also simple to download maps in advance for the region you plan to travel in (much smarter, since downloading 200mb of maps once you're already "there" is easier said than done). The map function shows your location, and also the most basic functions of a GPS: heading, elevation, speed, and coordinates. The InReach's successful message-send rate was 85% (instead of 70% in the case of the SPOT 2), which provided a small reassurance that if I did need the SOS function, it was more likely to work than the SPOT 2. In addition to that, not only could I watch the message successfully depart via my smartphone, I could also receive messages in reply. As mentioned above, the InReach operates on the Iridium network which is global, whereas Globalstar (which supports SPOT), is not. I was not able to find reliable reports on the coverage of Iridium vs Globalstar for the areas in which they overlap, but Satellite Phone retailers and reviewers almost unanimously favor Iridium. All in all, however, the InReach is not cheap to operate. To buy the unit and use it with the average subscription plan over the next three years will run between $950 and $1200. Obviously, the cost of this service is nothing compared to the value of it possibly saving your life, but the ACR ResQLink performs the basic SOS function better at a three year cost of $360 (taking into consideration the 5 year $150 battery life). Therefore, the InReach is best indicated for those who want messaging and are happy to pay for it. Easy one-handed (and gloved, if not mittened) SOS operation. Overall very intuitive and easy to use. Largest of the devices we tested. For me, it comes down to a choice between the ACR ResQLink and the DeLorme InReach. If I need messaging, I'll go with the InReach. If I decide that actually getting rescued is my top priority, I'll choose the ACR ResQLink. Personally, I am no longer considering either SPOT device. "Turns your smartphone into a satellite communicator"... that sounds pretty cool, right? This is one of those devices that cause me to detest the techie blog posts with headlines like that, which are based on corporate press releases and no real evidence. The SPOT Connect did not fare well in our test. I received my Connect, paid the $99.00 subscription fee, got it all registered, went to pair it with my iphone, and the frustrations began. You really don't need to read any further if you are interested in my opinion, which is: the Connect does not perform well, so don't buy it. First of all, the Connect is small, matte black, and nondescript. It has no instructions visible on its exterior and is difficult to find inside your pack. It has only a power button, and a shielded SOS button. I can imagine that a team of hip industrial designers applauded themselves for its sleek look, but in my opinion this device is a failure not only ergonomically, but also technically and functionally. At the very least, any beacon should have clear and simple operating instructions written on the outside of the device. It should be bright and easy to find in the bottom of your backpack or in a low-light situation. And, most importantly, it should inspire confidence by performing all of the non-SOS functions (which are the only ways the device can be used in non-emergency situations) that it purports to be capable of without any problems. The Connect accomplished none of these goals during our testing. The first and most important issue that we had with the Connect was its resistance to pairing successfully with our iOS (mainly) and Android smartphones. While the DeLorme paired immediately and without problems, the Connect failed 17 attempts in a row, only pairing successfully on the 18th attempt. It continued to fail pairing an average of 90% of the time throughout the test. Unfortunately, pairing is only the first step and the Connect then failed to be found by the SpotConnect App even more than 90% of the time. If this was just a setup hurdle, and after a day of technical frustrations the Connect would have just worked for the rest of the test, then I might not have been so critical. But the Connect does not pair automatically nor does the app automatically find the device, so each time the app is closed or the Connect is turned off, the re-pairing issues start anew. This basically made the device unusable, since it was so difficult to pull out the phone for a quick reference or message. The main feature of the Connect is its message sending abilities, and the pairing issues and app failures rendered it practically useless during our tests. Like the DeLorme InReach, the Connect's strengths lie in its smartphone pairing capabilities and an enhanced functionality via your smartphone. The main feature is being able to type custom messages (41 characters short, anyway) to your contacts (and no, you cannot receive messages like you can with the InReach, this is a one-way communicator). The SPOT Connect App for iOS and Android is not badly done, except for the fact that the app functions are all totally inaccessible unless you manage to pair your device. Amongst five different phones (3 iOS and 2 Android), the Connect failed to pair successfully 90% of the time, and when it did finally pair on my iphone, the SPOT app could not find the device most of the time. Once the device was found, each time you turn off the Connect or your smartphone you will have to re-pair them, again suffering from the same miserable rate of success. All in all, this is one piece of equipment that I cannot recommend or rely on. Bluetooth Pairing issues are widespread and common. Pairing problems are persistent and standalone functionality is SOS only, which means that you won't be getting all of what you paid for unless you are lucky enough to get one that functions as advertised. Will not pair automatically on startup, requires re-pairing each time. The ResQLink, operating on the COSPAS/SARSAT military satellite network described above, is arguably the most effective of all the devices tested when in SOS mode. But, realistically, it only has an SOS mode. ACR does offer a limited "Self-Test" message service which seems meant to help it compete with SEND devices but, due to the finite battery life, the ResQLink is only good for 220 self-test "OK" messages without GPS information, and 12 messages with GPS information, during the battery's 5 year lifespan. To add this service to your device costs $59.95 (www.406link.com). I can't really think of many situations in which this could be viewed as a valuable function, other than to occasionally reassure yourself that the ResQLink is capable of sending messages. Based on ACR's track record alone, I would be more than happy to trust that it would work when needed and I would not buy this device if messaging was a priority for me. The ResQLink's lack of real messaging capabilities is not a reason to overlook it, and if your main concern is having the most powerful and reliable beacon to use in case of emergency, and tracking features aren't crucial, then this is definitely the device for you. The dual SOS transmission (406MHz / 121.5MHz) and 5 watt transmission power coupled with the reliability and global coverage of the COSPAS/SARSAT constellation makes this the most "serious" device that we tested, in pure SOS terms. The bottom line here is that the SOS function is probably the most effective of any other device we have considered. The ResQLink transmits your SOS message at 5 watts of power, compared to 0.4 watts for the SPOT 2, and 1.6 watts for the InReach. If the lack of messaging is not a deal-breaker for you, then this device is the clear winner. COSPAS/SARSAT's reliability and long track record. Easy one handed (even gloved) operation. Unless the lack of messaging is a con for you, I found no faults with this device. The funny thing about this app is that in certain situations, it could work as well or better than a SEND device. I have been in situations where a solid 3G signal can be had on my smartphone, but no satellite signal can be found. For instance, in thick trees along a steep cliffband in in the Alps, where 3G networks are massively more expansive than in the rural US, I was able to check my email, make a call, and check to be sure that my buddy Carson was still sitting on his couch in Waialua, Hawaii. And he could have checked his app to see that I was camped out in the trees there, below a massive BASE jump near Chamonix, even if I was unconscious and not able to pick the phone and dial. Meanwhile, I had no signal on either of the SPOT devices or the DeLorme. One thing that became very apparent using the InReach and SPOT devices was that without a very clear view to an open sky, they do not work well at all. A phone well inside a 3G network area, on the other hand, works under cover, indoors, etc. While at first I was skeptical and considered not even including it, this is an interesting extra option for people who travel in areas where mobile phone coverage (I'm talking solid 3G signal) is plentiful. Clearly, however, this could never be considered as a standalone emergency messaging device. Don't even think about relying on this app for anything other than entertainment and stalking your friends who are willing to go through the setup process. Good way to keep an eye on your girlfriend or boyfriend (or kids) or their phone, anyway. It only works when your phone is on and has an excellent data signal. It does not connect you with emergency services. It's useless as an SOS device. In a nutshell: The ACR ResQLink is the winner for people who put priority on an effective SOS transmission. 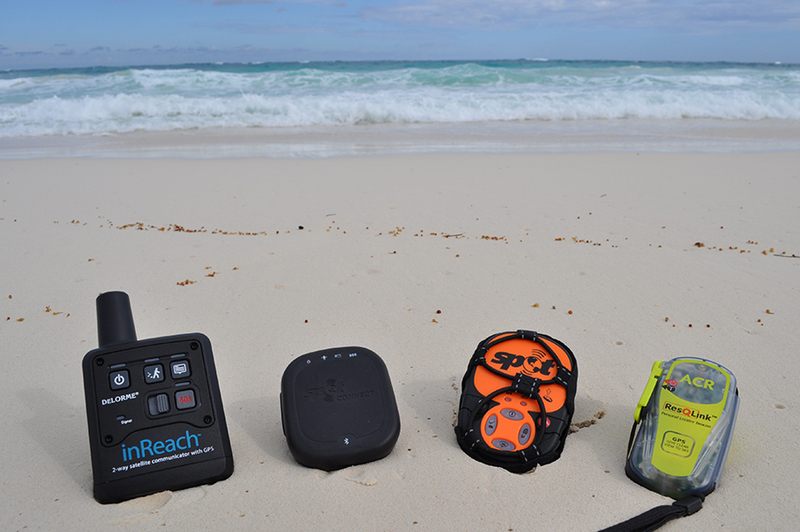 The DeLorme InReach was by far the most feature-rich device and is a clear winner in the messaging and maps category. The SPOT 2 is a small and light option with limited messaging and less power than the InReach. The SPOT Connect is not worth considering in the face of the competition.